This May will mark two years of living in New York. It’s crazy to think how quickly time passes when you’re overseas and navigating a new city. Every time someone comes to visit or is passing through for work, I send them my big list of must-do’s and have finally taken the time to put them in a journal post. This is my curated Stylephiles guide to New York - enjoy! Mercer Hotel, Soho. It's only 75 guest rooms on six floors of a Romanesque revival building. Opening in 1997, The Mercer is the sister hotel to Hollywood's Chateau Marmont and is smack bang in the middle of the bustling Soho streets. 11 Howard, Soho. I've stayed here before and was lucky enough to review it for Mr & Mrs Smith. I go here often to work from their library and have lunch (Tomato soup with grilled cheese). You can read my full review HERE and I would stay here again and again. The Arlo hotels are on the cheaper side and are one of the new breed hotels that has less of the luxuries but it's clean, cool and quirky. 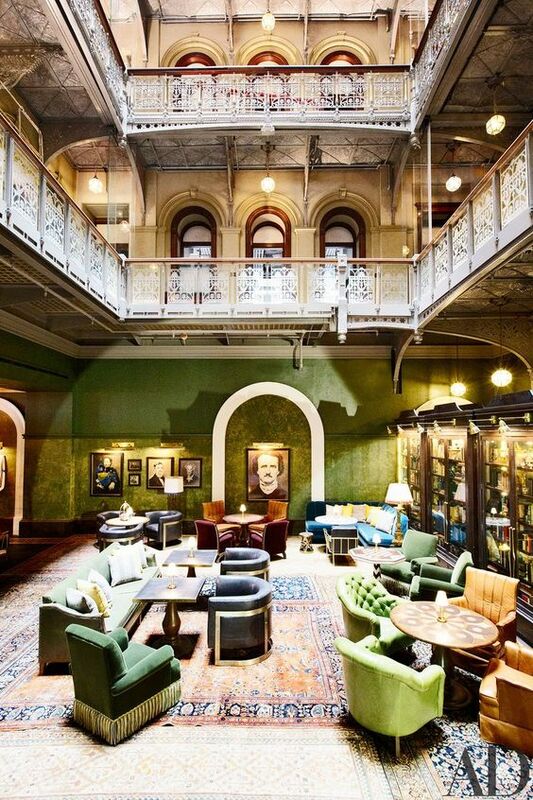 They have two locations and last year won the Gold Key Award for Best Emerging Hotel Concept. I have had many friends stay here and they have all loved it. Hotel 1 Dumbo overlooks the East River and almost every room has the manhattan skyline view. This one has a great rooftop, common space and restaurant, so if you’re having meetings in BK it's a no-brainer and very impressive. Pamper yourself at Aire Baths with a steam, soak and massage. It’s so beautiful and feels like you are somewhere deep in the Medina in Marrakech. You must book in advance, take your swimsuit and leave your phone tucked away in your private locker. Rosemary’s in the West Village is great. You can’t make a reservation but the wait moves quickly. Order the brussels sprouts no matter what, as they are the best in NY. Ruby’s in Nolita is an Australian cafe, everything on the menu is great and I always order the Chia Muesli with steamed milk. The wait can be long and the tables are small so not great for kids, prams or larger groups. Claudette* is great for lunch, takes reservations and you can sit on the street and people watch on 5th Avenue. The truffle hummus is something that I always order and the interiors are french-inspired along with the menu. RW Guild is the latest project for the design duo Romand and Williams. ‘We view the Guild as part of our home, and we made it the way we like things to be: with excellent everyday French cuisine at La Mercerie Café starring Chef Marie-Aude Rose, and a flower shop by local botanical savant, Emily Thompson﻿’ It’s my favorite place to have tea and pastries in Soho. Cafe Altro Paradiso* is the best Italian in Soho. There are a few things we can’t go past ordering - the Cache Pepe Pasta, the Buratta and the Fig and Olive Oil homemade gelato. Down the back of the restaurant they have a display of vintage bread boards that will make you feel like you are dining in Nonna's ( stylish ) kitchen. Mercer Kitchen* is great for a late dinner, this is under the Mercer Hotel. My favorite dish is the Salmon crispy rice sashimi and they have a cute bar area. I dream about this dish and sometimes will order two serves. Waverley Inn* in the West Village is known for their truffle mac and cheese and chicken pot pie. It’s one of the oldest restaurants in NY and is perfect on a cold night as they have a open fireplace in the bar area. Bond Street* in Soho is great Japanese and walking distance from the main shopping area in Soho. Keep your eye our for Gigi Hadid and she lives right next door. Estela* is also in Soho is great for a drink and dinner. It’s the sister restaurant of Cafe Altro Paradiso and is just as good. The Endive salad with walnuts, anchovy, and ubriaco rosso is our go-to. Walk-ins are welcome but make a reservation if you can. Emily* is in Brooklyn and if you want a Pizza combination that will blow your mind, order their signature Emily: mozzarella, pistachio, truffle sottocenere and honey. No gluten free options. Lucali’s is right around the corner from where we live in Carroll Gardens. It's nice to know Jay Z and Beyoncé opted for a pizza at Lucal’s instead of going to the Grammys a few years ago. This is great but with Marc’s recent celebrity press it has made it hard to get a table. There are only 10 candle-lit tables, it's cash only and has two items on the menu. It’s BYO and will be one of the best NY eating experiences you will have. The doors open at 5pm and if you miss out on a table you can always do what we do and order a takeaway and eat it on the street. * Make a reservation, most are on Open Table. 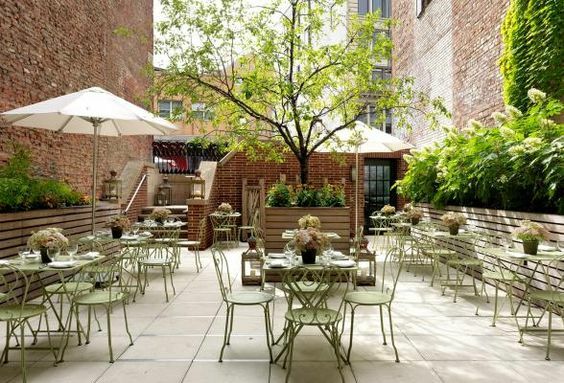 The courtyard in the Crosby Hotel is lovely for an afternoon wine. The guacamole is also a yummy snack before dinner and they have a great cocktail list. The bar at the Beekman in the financial district and is very beautiful and does a lovely cheese plate and apple tart. It's great for people watching and has a smart casual dress code. All the restaurants mentioned are great for drinks with the exception of Emily, Lucali's and Bond Street as they don't have bars. Homenature is full of beautiful items for your home all in a palette or natural, cream and white. They do their own range of furniture, stock our favorite rugs and have lots of accessories you can squeeze into your suitcase. The Primary Essentials is in both Brooklyn and Manhattan and is a edited mix of special objects for the home with an emphasis on how we live our daily lives. ABC basement. For those who love ceramics this has a great selection of color and is my most visited level of this NY institution. The restaurant here is also fabulous for lunch - you'll need a booking. Soho is great for all the stand alone boutiques. In terms of department stores, Barney's , Saks and Bergdorfs are the nicest. Stay away from Bloomingdales - it's an awful shopping experience in my opinion. Intermix is dangerous and it’s one of those stores that I see 15 things I desperately want in the first few mins. They carry a collection of specialty global fashion brands and are known for curating the most sought-after styles from a compelling and edited mix of both established and new designers. Bird is BK based and supports the best emerging designers with a focus on locally and sustainably produced independent collections. They have quirky options, great accessories and you’ll always find something you love here that is well made and unique. The Ulla Johnson store on Bleecker street opened last summer and is filled with her latest collection including a new accessories range. This store was created by design god Alexis Brown and I get as much fashion inspiration from here as I do interiors. Ulla’s style is perfectly relaxed and in addition to the lovely fashion, the weekly floral installation by Saipua are worth visiting. WANT Les Essentials is the stylish brain child of a set of handsome twins in Canada. They fill the gap in the modern traveler's arsenal by offering timeless pieces that place equal value on fashion and function. Located in the West Village just around the corner from Carrie's stoop on Perry Street. Explore Hudson Valley, Blue Hill Stone Barns, Amagansett, East Hampton and Sag Harbor.